Circumstantial evidence links Human Settlements Minister Tokyo Sexwale to two opaque companies -- fronted by President Jacob Zuma's nephew -- that have marched off with sought-after Congolese oil blocks already allocated to others. Sexwale and an associate, Mark Willcox, chief executive of their investment vehicle, Mvelaphanda Holdings, this week denied any stake in the companies, but Willcox confirmed he and Mvelaphanda were giving "strategic advice" to Zuma's nephew, Khulubuse Zuma. Democratic Republic of Congo (DRC) President Joseph Kabila has come under fire for undermining investor confidence since he confirmed the award of two exploration blocks to the companies, Caprikat and Foxwhelp, last month. His government had previously allocated them to Irish oil major Tullow and South Africa's Divine Inspiration Group. President Zuma's ethical conundrum is that his relative looks set to benefit from the kind of commercial smash-and-grab that is swayed as much by diplomatic consideration as financial sense. All indications are that the DRC will be worse off than it was with its previous contract with Divine Inspiration Group, while questions pile up about whose interests will benefit -- local or foreign, political or commercial? The ownership of the two companies is shrouded in mystery. Mossack Fonseca, a law firm with headquarters in Panama, registered both in the British Virgin Islands, a haven of corporate anonymity, and acts as their letterbox. Marc Bonnant, a Swiss advocate specialising in "business crime defence", fronts as the two companies' sole director. Publicly, Khulubuse Zuma has been presented as the owner of both. Mpumelelo Tshume, chief executive of Khulubuse's Impinda group, earlier told the Mail & Guardian that Caprikat and Foxwhelp were held by trusts -- which he suggested were Khulubuse Zuma's only -- and would be "consolidated" into Impinda in time. He suggested that Medea, a Luxembourg-based oil consultancy that has confirmed its involvement, was no more than a paid consultant. But then Reuters reported that, while Khulubuse Zuma had signed with the DRC authorities on behalf of Caprikat, Michael Hulley, President Zuma's lawyer, had signed on behalf of Foxwhelp. Khulubuse Zuma dismissed any inference that President Zuma was personally involved and told Reuters: "He [Hulley] is my legal adviser and he signed because I couldn't sign for both. It is a technical thing." But the façade of Khulubuse Zuma as the sole owner was undermined by a businessperson with insight into the deal. Asking not to be named, he claimed that Medea, or its boss, Giuseppe Ciccarelli, had a share alongside Khulubuse Zuma and that Hulley appeared to be a partner in the deal, not simply a lawyer. The mystery deepened when the M&G obtained a copy of the contract signed in May between the DRC, Caprikat and Foxwhelp: it gave Mvelaphanda Holdings' address in Illovo, Johannesburg, as Caprikat's legal domicilium, while it gave Foxwhelp's as Mvelaphanda Holdings' former address in Melrose Estate, Johannesburg. The Melrose Estate premises are now used by the charitable Sexwale Family Foundation. Last week Willcox travelled with Khulubuse Zuma and Hulley to Kinshasa for further talks about the deal. Mvelaphanda Holdings is majority held by two Sexwale-linked trusts. Although he resigned his trusteeships to comply with executive ethics rules when he rejoined the government last year, the benefit of ­Mvelaphanda's investments still accrue to his family. Mvelaphanda is heavily invested in the African oil sector through offshore companies, including New African Global Energy. New African, Sexwale and Willcox tried to bag the same Lake Albert oil acreage in 2008, including through ultimately abandoned negotiations with the Divine Inspiration Group, or its partner Sacoil. Tshume might have provided more possible evidence of Sexwale's companies' involvement when he told Business Times earlier: "The bidding process for the blocks took place earlier this year, but the engagement has been going on for the past two years." Neither Caprikat nor Foxwhelp existed two years ago -- they were registered in March -- and Khulubuse Zuma rose to business prominence only after his uncle's election as president 18 months ago. If he wasn't talking to the Congolese about securing the oil rights, who was? One inference is that the deal flowed from the contacts originally initiated by Sexwale and Willcox. But as soon as the mystery seemed to lift, in came the categorical denials. A Sexwale spokesperson said: "Mr Sexwale and the [independent] trustees confirm that neither Mr Sexwale nor his trust or any corporate entities with which he is directly or indirectly associated have or will receive any benefit from the DRC oil blocks." Willcox also denied any financial interest, however remote. He confirmed travelling to Kinshasa, partly for his own unrelated business purposes and partly to assist Khulubuse Zuma, who he said had sought his "strategic advice" on "a number of commercial endeavours [which] including the applications surrounding blocks one and two in partnership with Medea." He denied he was trying to curry favour with the presidential family: "I find this a slightly insulting question. I have been actively involved in mining, oil, black empowerment and other related sections ... over the last 15 years. 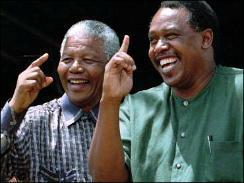 "I have been a friend of Khula Zuma long before Mr Zuma became president. I have assisted and am currently assisting a number of black empowerment companies with respect to structuring or negotiating a variety of transactions on a pro bono basis." As for the Mvelaphanda addresses on the DRC contract, he said Khulubuse Zuma, who is from Durban, did not have a Johannesburg office at the time and "in the intervening period, for ease of administration, due to the fact that he was spending most of his business time in Johannesburg, he used these office addresses as a domicilium". In an apparently calculated leak by Willcox, Bloomberg published the essentials of this story as the M&G was going to print. But in the story Medea's Ciccarelli muddied the waters further by saying Mvelaphanda was among a number of South African groups that are "interested" in the project. But he maintained "this interest did not involve ownership". Hulley, on behalf of Caprikat and Foxwhelp, said President Zuma had "no relationship or interest with either Caprikat or Foxwelp, either directly or indirectly at any level, nor has he participated even remotely in any negotiation or discussion pertaining to any of its operations or structure. To suggest otherwise is disrespectful of the president and, we dare say, the government of the DRC." Hulley failed to answer direct questions about the ownership of Caprikat and Foxwhelp. The presidency did not respond. The DRC's contract with Caprikat and Foxwhelp is significantly worse for the DRC than the 2008 deal it displaced with South Africa's Divine Inspiration Group. The resource watchdog, Platform, told Reuters earlier this month it estimated the loss of revenue to the DRC at up to $10-billion, compared with the Divine deal. In fact, the Khulubuse Zuma-Michael Hulley contract is similar to the deal signed with Irish-based firm Tullow Oil, which the DRC government annulled ostensibly because it was too unfavourable. Caprikat and Foxwhelp gain 60% of net revenues for the first 12million barrels produced, later falling to 55%. In the Divine ­contract the company share falls to 50% then 40%. Caprikat and Foxwhelp will pay only 9% royalties on the first 12-million barrels produced, rising to 12,5% after that. Divine paid 12,5% throughout. Caprikat and Foxwhelp will have to allocate $125 000 annually per exploration block on community upliftment. Divine was charged $250 000, rising to $300 000. Hulley responded: “The terms of the agreements ... are by implication acceptable to the parties ... In our view [they] are in full compliance with recently enacted legislation in the DRC which imposes strict obligations on contracting parties in this sector. President Jacob Zuma’s lawyer, Michael Hulley, denies that two companies in which he and Mr Zuma’s nephew, Khulubuse Zuma, are involved had sold their claims. THE case of the disputed Democratic Republic of Congo oil rights took a new turn yesterday when President Jacob Zuma ’s lawyer, Michael Hulley, denied that two companies in which he and Mr Zuma’s nephew, Khulubuse Zuma, are involved had sold their claims. Business Day reported yesterday that according to a British Virgin Islands company purportedly representing Mr Hulley and Mr Zuma’s companies Caprikat and Foxwhelp, their clients had “assigned their rights”. ﻿ “It follows that our clients no longer have any direct interest in or operation control over the exploitation of Blocks 1 and 2 of the Albertine Graben,” the letter from legal firm Walkers said. Last night, Mr Hulley clarified that Caprikat and Foxwhelp had assigned their rights to an entity that incorporated both its interests and that of the Congolese government. “Such assignment is neither a sale nor a disposal of its interests for value to any third party. To liken it as such to any other local transaction can only be calculated to mire it in a controversy which exists only in the minds of those who are intent on seeing the transaction fail,” Mr Hulley said. He said the companies had paid a substantial amount as part of the signature bonus, and finances had been committed to social works programmes in the area. Seismic surveys and other preparatory work had commenced. The statement follows a highly disputed allocation process involving British company Tullow Oil which came close to being granted the rights. Tim O’Hanlon, Tullow’s vice- president for Africa, said yesterday that he remained convinced that the companies intended to sell the stake without developing it.